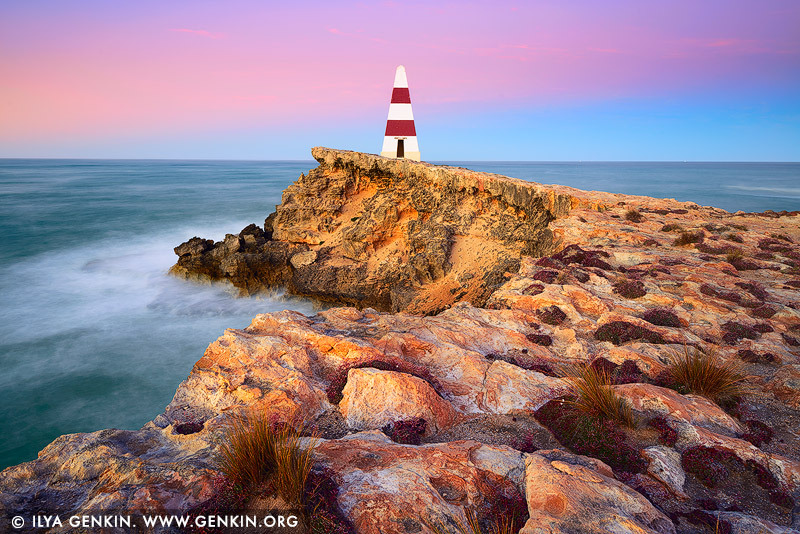 The Obelisk was erected on Cape Dombey near Robe, South Australia in 1852 and was used to navigate the entrance to Guichen Bay, as well as to store rocket lifesaving equipment. The firing of rockets, carrying baskets to distressed ships to bring passengers ashore, saved many lives. It later assisted passing ships with navigation because its height of 12m (40 ft) makes it visible 20km (12mles) out to sea. The erosion of the land surrounding the obelisk will mean it will eventually fall away so make sure you visit this icon whilst staying in Robe. This image belongs to the travel and nature stock photo library. This stock photo of Robe Obelisk at Sunrise is available for licensing for commercial and editorial uses including websites, blogs, books, magazines, brochures and advertising. Restrictions may apply for images which contain third party copyrighted material or sensitive subjects. Photos of artwork are for editorial use only. This image id AU-ROBE-0001 of Robe Obelisk at Sunrise, is copyrighted © by Ilya Genkin. This is not a public domain image.